Commitment is the communicated pledge to do something. It requires the willingness to make the sacrifices in order to fulfill it. All commitment requires sacrifice on some level. This is something a lot of people are afraid of. By not committing however, one is sacrificing the good that would come from committing. Ultimately a sacrifice is being made, but one is pro-active and the other is passive. Not all commitments are explicit or verbal. There are many implicit commitments we make in relationships that vary from context to context. A lot of friction comes from conflicting or just different expectations about what one should be committed to. It is best to communicate all commitments and expectations explicitly, even those that might seem obvious. Intimacy means knowing deeply and being familiar with another person. Their thoughts, fears, hopes, dreams, preferences, experiences, memories, flaws, and imperfections. However, intimacy is more than a collection of facts, stories and how much we know of their personal narrative. It is the con-natural, familiar, or intuitive knowledge that we have of another person. Knowledge which can’t be reduced to any particular part. The whole is greater than the sum of its parts and the more we know of the whole the more we are intimate. The more time we spend with someone and the more variety to the contexts which we spend with them, the more fully we know them. Intimacy enables us to see if there is compatibility. Sometimes it results in discovering incompatibility. Inevitably there will be some incompatibilities, as one grows more intimate one must decide if it is something that one can embrace on behalf of the whole even if that part is distasteful. Passion or emotion includes more than just romantic or sexual desire. It can also just mean affection or general attraction to someone you appreciate. All emotions or passions are instantaneous felt judgements about our relationship to something or someone. They provide us with a wealth of data. Our “gut” operates on an unconscious level making judgements about sensory data we are not even aware of. Feelings arise from new situations being filtered by past experiences. This gives us the experience of intuition. Emotions enable us to grasp what cannot be articulated with words and alert us to the highest values as well as hidden meanings. Nevertheless, feelings are not facts. We live in a culture that lauds emotions to excess. Just about every day someone will say “follow your heart” or “think positively!” This is problematic, not because emotions are bad, but because it is incomplete. These phrases indicate what is necessary, but not what is sufficient. No matter how intense the initial phase is the emotions will fade. In romance, the goal is to build intimacy such that when (not if) the initial flood of passion slows it becomes a steady stream of stable affection. Affection arising from objective compatibility. Communication connects the previous three. Communication is transferring to another an idea or feeling. It is not just verbal, but most of it is non-verbal and takes the form of sub-text. Communication lets the other know where the emotions are. Communication is what brings about emotional intimacy by revealing our inner thoughts and feelings. Communication is what establishes what commitment should be there and the sacrifices necessary to fulfill them. Communication is when a commitment becomes binding. Without communication none of the three can exist. Honesty is always essential. In order to become good at communicating you need to do it and do it often. Fail frequently. Prioritizing what is important to communicated is critical. Everyone should learn which words communicate both the denotation and connotation intended. Listening is essential to communication, make sure you understand what the other person is saying, reiterate it back to them before responding. That is the only way to stay on the same page. A complete relationship has a balance of the first three components. But if you have passion and intimacy without commitment you end up with just infatuation. This happens regularly in romantic relationships. Overtime as intimacy increases, the passion will decrease as reality sets in and then if there isn’t any commitment or compatibility, the relationship will end. It is normal for romantic feelings to not just fade, but sometimes slip into hatred then bounce back again. One cannot rely solely on one’s feelings because at one moment what seems “right” will become “wrong” in another without anything real to back it up. That is part of what is fascinating about being human is all of the inner contradictions we have, emotions fighting emotions even! Likewise there are circumstances where there is intimacy and commitment without any strong passion. This can be a very good and stable relationship. Many sibling or familial relationships are like this. In times past this was seen as more important and even sufficient for a marriage to last. Many old couples exhibit this profound familiarity that lacks the dramatic expressions you would see in most Rom-Coms. This kind of relationships brings sobriety to life. Where there is passion and commitment, but no real intimacy, there can be a very tumultuous relationship. This is what a lot of people end up with as married persons who haven’t been truly vulnerable and have hidden themselves behind sexual passion. It also can be seen in many sibling relationships who never really get to know each other, because they assume they already do. There are childhood friends, teammates, and other relationships we have explicit and implicit commitments to without any real knowledge of the other person. This isn’t always a bad thing, it’s necessary for these relationships to exist in order for society to function. We can’t be intimate with everyone to the same degree. However, if you want a satisfying deep relationship, not having intimacy obviously won’t work. Of all three commitment is the most important for a relationship to last. Intimacy is the most important as being the end and purpose of the other two. Passion is important only in so far as it initiates and enlivens the others. It is essential in many ways, but is the least important for a real relationship because of its fluctuating nature, that can often be contradictory. For a relationship to work there have to be real, objective, everyday qualities that must be determined if there is the compatibility necessary to make certain commitments. As intimacy increases, so does commitment. Commitment guards intimacy and intimacy guards passion. 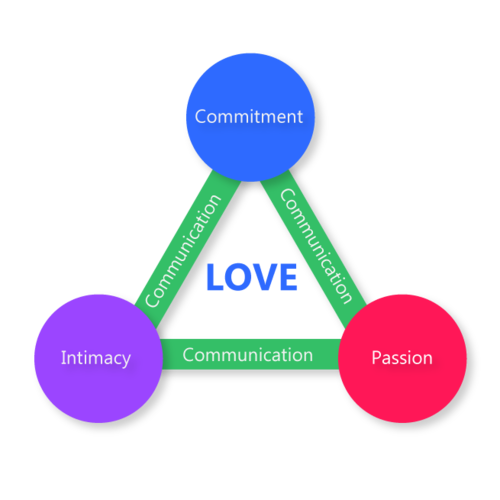 With time and communication, and communication is key, intimacy will grow to determine compatibility and if a further commitment should be made. Love is not just an emotion, but also a choice. All choices require deliberation or thinking about whether or not this or that choice should and can be made. Emotions play a key role if that choice is made, but usually should not be central. Love is the thinking, willing, and acting towards the good of the beloved for their own sake. Love ends with the delight from being in a sort of union with the beloved, whether of mind, heart, or body according to the relationship. Whether that be parent, friend, or spouse. If you are beginning a new romantic relationship it is important to set clear expectations in terms of commitments and communication. Commit to small chunks of time to stay together and what levels of intimacy you will have. Revisit whether or not its working at the end of those periods. If it is working commit to a longer period of time. For example, start with 2 weeks, then 4 weeks, then 6 weeks and so on. Each Time revisiting and looking at objectively if there is compatibility. This will free you to spend that time learning about each others likes and dislikes, memories, and other things, rather than just fantasizing about what life you could have together. It will also make sure to carry you through the natural ups and downs of attraction. Be on guard about what your emotions are leading you to commit to. Otherwise you can end up in a situation where your feelings lead you to commit, at least verbally, to something far more intense (“I’ll always be there for you”) that later your feelings tell you that you shouldn’t have and in fact you are unable to. It’s human nature to trust the feelings that are most immediate, even if they contradict previous or future feelings. If you reassure someone that you will “be a force together” without understanding the sacrifices that entails, you are deceiving them. Not intentionally, but that still is stating something false. There is a big difference between saying something you feel and saying something you intend, knowing what is required to follow through. It’s best to be patient until there is sufficient time and intimacy before making certain commitments. I think something all millennials can relate to is this feeling that as they get older no one actually knows what they’re doing. It seems that most of us feel we are still waiting for the day when we will feel like and know we are adults. It is upsetting to discover most people, even of our parents generation are just as unsure, faking it, and often just as immature. This lesson about relationships I believe is essential to adulthood and could help prevent a lot of divorces in particular. When most people vow “till death do us part” today, if they don’t really know what that sacrifice entails I question if that marriage ever really took place. However, if you can learn to ratchet up your intimacy and commitment fueled by passion according to a long, reasonable, and deliberate process, it is likely you will have a long lasting relationships. I fully admit I am not the first to recognize these, but this is my understanding and how I put it together. I beg you to share it with others. You put into words similar thoughts I had when I committed my life to Dad.